A descendant of HSB, told me that when he had discovered the abandoned statue back in 2005. He was horrified at the poor condition and the insecure storage arrangements in an open council yard. He tells me he wrote to various councillors and the only got a reply from David Henshaw in 2006. But his words meant little because since then can be seen in the pictures below, the statue has been damaged on at least two more occasions. Also it remains in the unsecured yard where people can drive up to and even into the statue. I am an enthusiast for the great 'Manxman' Hugh Stowell Brown and I would love to see his statue restored. Once that happens it would be fantastic if it could be located back near its original location which was close to the Liverpool Philharmonic Hall In Myrtle Street. Christian Minister, Preacher and Social Reformer. He was born 10 August 1823 at Douglas on the Isle of Man, the son of Robert Brown a low church Anglican vicar of St. Matthew’s Chapel in Douglas Market Place. Hugh became a very well known and much respected Liverpool preacher and social reformer during the nineteenth century. His work particularly his public lectures brought him great renown especially amongst the poor of Liverpool. Through connections with an Scotchman named Dr. Macfarlane who lived in the next parish and who was an army surgeon and had previously served in the Peninsular War. The doctor had a son David, who was a land-surveyor, in want of an apprentice, and it was arranged that Brown should go to him taking up employment as an apprentice land surveyor. . On the 19th February 1839 at the age of 16 he left the Isle of Man taking the short sea journey to England to learn land-surveying and obtained an appointment with the Ordnance Survey. He worked as an assistant to David Macfarlane, who was responsible for the survey of Harborne and Smethwick, three miles to the west of Birmingham. He gave up Land surveying shortly afterwards and in 1840 moved to Wolverton working at the London and Birmingham railway engine shop. During this period he became a teetotaller and a Sunday-school teacher. In 1843, he decided to become an Anglican vicar and attended a college on the Isle of Man. He was never convinced that it was right to baptise babies and in 1846 he gave up his studies because he realised his beliefs were Baptist. In March, 1847 he travelled to Liverpool on the invitation of Mr Godfrey who invited to him to preach in the Myrtle Street Baptist Chapel opened 10th January 1842. This was only the second sermon he had ever preached in his life, and by his own admission "did not speak well". The church realised this young man had a lot to offer and they engaged him as their minister. His preaching was simple, direct, and humorous, full of homely proverbs and epigrams. His speaking attracted the rich and powerful and the poor and uneducated of the city. When he went to Myrtle Street the church had 239 members; 40 years later in 1884, it had 849 members. In 1851, he began a series of popular Sunday afternoon lectures in St George's Hall. In the evenings he spoke to very large audiences of Liverpool’s working class, often consisting of Three to Four thousand who felt that they didn't have the right clothes to go to church. Through his work many of the city’s poorer people were encouraged to put their money in the "Workman's Bank" established by his church in 1861. This helped people to develop the habit of saving and prevented many hundreds of people from a life of poverty. During the last ten years of his life his name as a preacher had become a household word in Liverpool, and various honours were bestowed upon him. He became President of the Baptist Union of Great Britain in 1878, Chairman of the Liverpool Seamen's Friendly Society and President of the Liverpool Branch of the Peace Society. He was also very popular with the many Americans who visited Liverpool on his death in 1886 many letters were written to members of his family by residents in America and Canada, speaking of the great effect his preaching had upon their own lives. Although the time fixed for his funeral was inconvenient for working men, more than Ten thousand of Liverpool’s artisans were present at the cemetery and along the route. Following his death in 1886 a statue was paid for by public subscription and placed outside his church opposite the Philharmonic Hall, one of only three Liverpool clergymen to receive that honour. In 1939 Myrtle Street church was closed and later demolished. 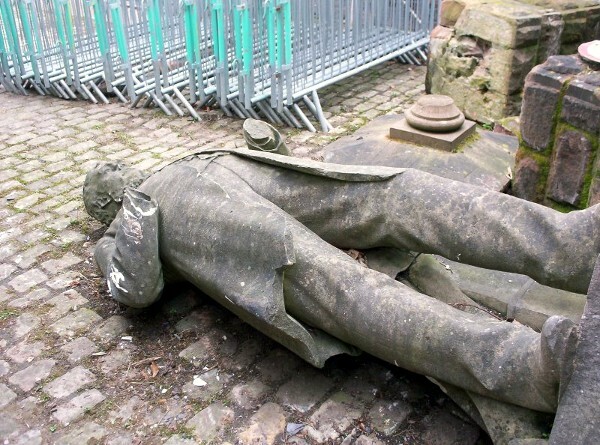 The statue and its plinth were moved to Princes Road, but the statue was attacked and taken down, and is now lying forlornly in a yard at Croxteth Hall awaiting repair and a new home. "If any proof were needed of the love and esteem in which he was held by the city of Liverpool, of the wide-spread influence of his life, the breadth of his sympathies, and the catholicity of his spirit, it would be found in the vast crowd which followed him to the grave. They were of all creeds and religions - Church of England, Unitarian, Roman Catholic, Nonconformist, were all represented by their leading members. Liberals, Conservatives, and Home Rulers were also represented officially, and hardly an institution of the city failed to show its respects to his memory. Although the time fixed for the funeral was one specially inconvenient for working men, at least ten thousand of Liverpool's artisans were present at the cemetery and on the route." Hugh Stowell Brown (10 August 1823 - 24 February 1886) Christian minister and renowned preacher. Hugh Stowell Brown was a preacher, pastor and social reformer in Liverpool in the nineteenth century. His public lectures and work among the poor brought him great renown. On his death a statue was raised to him, one of only three Liverpool clergymen to receive that honour. His brother was the Manx poet Thomas Edward Brown. Hugh Stowell Brown was born in Douglas in the Isle of Man, the son of a very low church Anglican vicar. At 11 years of age he was taken out of school to read to his father, who was then threatened with blindness. In this way, he acquired a fund of miscellaneous information which was afterwards of great use to him. In 1839, he went to England to learn land-surveying, and obtained an appointment on the Ordnance Survey. But he gave it up almost at once, and in 1840, we find him in the London and Birmingham railway engine shop at Wolverton. At this time he became a teetotaller and a Sunday-school teacher. By the end of 1843, he had decided to be an Anglican vicar and went to College on the Isle of Man. But he was never convinced that it was right to baptise babies and in 1846 he gave up his studies because he realised his beliefs were Baptist. He travelled to Liverpool that same year and was invited to preach in the Myrtle Street Baptist Chapel, only the second sermon he'd ever preached in his life, and my his own admission did not speak well. But the church realised this was a young man with a lot to offer and they took him on as their minister. In this position he continued during the rest of his life, and became one of Liverpool's greatest ever citizens. His preaching was simple and direct, and humorous, full of homely proverbs and epigram. His speaking attracted the rich and powerful and the poor and uneducated. When he went to Myrtle Street the church had 239 members; 40 years later in 1884, it had 849 members. But it was not only the congregation that benefited from his work. In 1851, he began a series of popular Sunday afternoon lectures in St George's Hall. Also in the summer evenings he spoke to large audiences of working class people who felt that they didn't have the right clothes to go to church – often a crowd of three to four thousand. Through his work many of the poorer people were encouraged to put their money in the "Workman's Bank" established by his church in 1861. This helped people to develop habits of saving, and saved many hundreds of people from poverty. In 1873, he visited the United States of America, when he recorded his opinion that that country would have "a future of greatness that has never been equalled in the history of the world." During the last ten years of his life his name as a preacher had become a household word in Liverpool, and honours of various kinds were bestowed upon him. He became President of the Baptist Union of Great Britain, President of the Liverpool Branch of the Peace Society, and Chairman of the Liverpool Seamen's Friendly Society. The son of Hugh Stowell Brown, J. Sirrett Brown founded the firm of Brown and Backhouse of Liverpool. He built many properties including The Hotel Victoria, New Brighton, Warren Point in Warren Drive and many more in the area. H.S. Brown's Great Grandson of the same name is still alive and in a nursing home in Wallasey, Wirral. 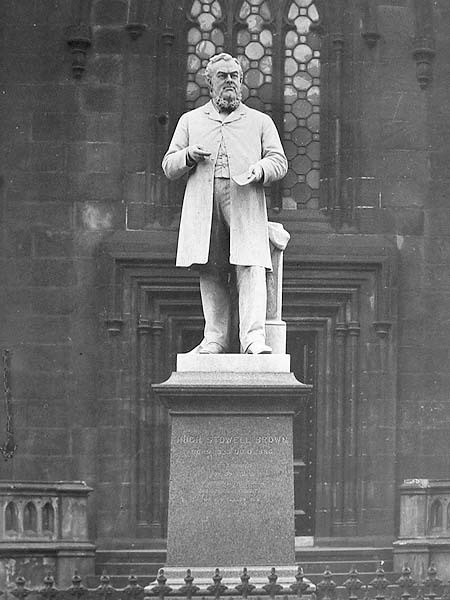 Soon after his death a statue of Hugh Stowell Brown was paid for by public subscription, and placed outside his church opposite the Philharmonic Hall. In 1939 Myrtle Street church was closed and subsequently demolished, and the site is now a car park. The statue and its plinth were moved to Princes Road, but the statue was attacked and taken down, and is now lying forlornly in a council yard in Liverpool. Evidence of the damage that has occurred since the statue was moved into storage in 1982. More recent damage shows the original colour of the the stone: ie white. Note damage to ear nose base and right arm is visible. Here we shows the statue in happier times it was unveiled on Tuesday 15th October 1889 in the churchyard at the front of Myrtle Street Baptist Church. 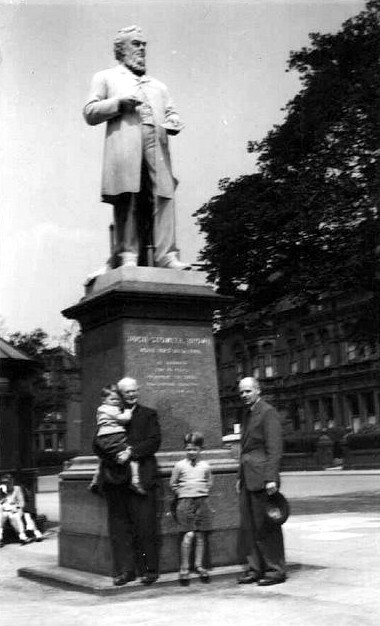 Later the statue was moved to Princes Road/Avenue on Saturday 25th September 1954. The plinth in 2005 part covered with raised foot way and planting area. aged 63 years. The Rev. Hugh Stowell Brown. today (Saturday) 27th inst., at 12 o'clock noon. Who fell asleep FEBy. XXIV. MDCCCLXXXVI. XVI AUGt. MDCCCLI. Aged XVI months. 1 DECr. MDCCCLXVI. Aged IV years and XI months. Pictures donated by the Brown family.